Hi there everyone! This is a Short Dynasty following cndneh's rules found: here. I found them on Carl's first and clarified some things while posting the rules on Boolprop! Some of you may have heard of this story simply because I've complained about all the files I've had to move over... you see when I left Carl's forum I wanted to go entirely off that forum. This story was one of the last remaining and I didn't want to give it up, but I didn't want to continue it there either, so I started porting it to a blog... (heavy sighing). It's been a tedious process, to say the least. I have 81 chapters on Carl's, and I'm in the middle of moving things right now to the blog. Once all 81 chapters have been moved, I will resume putting chapters up until I complete this (which shouldn't be too long, as I'm on generation 6 as we speak). I GOT 'EM ALL UP. BAM. BINGO. DONE. WOOOHOOO. Let's resume the fun! This story is LEAGUES different from my other stories. This is just a fun, quirky little story with no plot and me being goofy with some funny banter. >I will be using Store Content as there are no rules against them. >I have a Story Progression Mod because marrying NPCs by my 3rd generation doesn't sound like my ideal playthrough. >I only use game-fixing mods asides from the Story Progression (such as Overwatch and Errortrap by NRAAs). >I've turned off all Seasons except for Summer which I've maxed in length. >All types of weather is off (no rain, snow, hail -- Nothing). >I've placed a Consignment Store, Salon, Firestation, Elixir Store, Junkyard, Equestrian Center and Laundromat in Dragon Valley, but those are the only other lots I've placed. >I will reduce my funds to 1800 after getting the Future Portal (after I sell that and the camera). >This is going to be crazy and fun. Join me on my journey. >Portraits of all Heirs and founder required (+1 point for portrait). >Heir is first child to have rainbow skin. Chapter 11: Triple the Fun? Chapter 15: Hello From France! Chapter 26: Can We Slow Down Now? Chapter 72: We LOVE You, Felix! Last edited by Livvielove on October 10th, 2017, 11:09 pm, edited 14 times in total. 1 point for each child born (living on the lot or not), adoptive/cloned kids are allowed but don't count (This counts for the heir only, children of the brothers/sisters of the heir don't count). 1 point for each LTW completed. 1 point for each property bought in full. 1 extra point for each fully upgraded property. 1 point for each maxed skill. 1 extra point for any super maxed skill. 1 point for top of careers reached (rabbit hole or self-employment). 1 point for medium gravestones achieved for direct family. 2 points for large gravestones achieved for direct family. Ara and Bradan had four children (+4). Ara completed her Lifetime Wish (+1). Bradan completed his Lifetime Wish (+1). Bradan maxed the Athletic Skill (+1). Ara maxed the Gardening Skill (+1). Ara supermaxed the Gardening Skill (+1). Ara maxed the Gardening Career (+1). Bradan maxed the Athletic Career (+1). Bradan left a medium gravestone (+1). Ara left a large gravestone (+2). Ara got her portrait done when she was an adult (+1). Of their children before the heir came of age: Tessa maxed the Athletic Skill (+1). Aiden maxed the Logic Skill (+1). Sam and Ima had three children (+3). Sam maxed the Logic Skill (+1). Ima maxed the Logic Skill (+1). Sam supermaxed the Logic Skill (+1). Ima maxed the Gardening Skill (+1). Sam maxed the Medical Career (+1). Sam completed his Lifetime Wish (+1). Ima maxed the Medical Career (+1). Ima completed her Lifetime Wish (+1). Ima left a large tombstone (+2). Sam left a large tombstone (+2). Sam got his portrait done as a Young Adult (+1). Of their children before the heir came of age: Reia maxed the Logic Skill (+1). Reia maxed the Alchemy Career (+1). Reia maxed the Photography Skill (+1). Reid and Steph did not have any children before the heir came of age. Felix and Echo had two children (+2). Felix maxed the Private Investigator Career (+1). Felix maxed the Charisma Skill (+1). Felix maxed the Street Art Skill (+1). Felix maxed the Fishing Skill (+1). Felix maxed the Logic Skill (+1). Felix maxed the Painting Skill (+1). Felix maxed the Photography Skill (+1). Felix maxed the Cooking Skill (+1). Felix completed his Lifetime Wish (+1). Echo maxed the Mixology Skill (+1). Echo maxed the Gardening Skill (+1). Echo maxed the Fishing Skill (+1). Echo maxed the Logic Skill (+1). Echo maxed the Handiness Skill (+1). Echo maxed the Photography Skill (+1). Echo maxed the Writing Skill (+1). Echo completed her Lifetime Wish (+1). Felix maxed the Advanced Technology Skill (+1). Felix supermaxed the Charisma Skill (+1). Felix supermaxed the Street Art Skill (+1). Echo maxed the Gardening Career (+1). Felix left a large tombstone (+2). Echo maxed the Alchemy Skill (+1). Echo maxed the Painting Skill (+1). Echo left a large tombstone (+2). Foxglove left a medium tombstone (+1). Felix and Echo did not have any children before the heir came of age. Dagan and Yolanda had three children (+3). Dagan maxed the Painting Skill (+1). Dagan maxed the Cooking Skill (+1). Dagan maxed the Handiness Skill (+1). Dagan maxed the Writing Skill (+1). Dagan maxed the Photography Skill (+1). Dagan maxed the Logic Skill (+1). Dagan maxed the Gardening Skill (+1). Dagan completed his Lifetime Wish (+1). Yolanda maxed the Charisma Skill (+1). Yolanda maxed the Photography Skill (+1). Dagan maxed the Fishing Skill (+1). Dagan supermaxed the Painting Skill (+1). Dagan got his portrait done as a Young Adult (+1). Dagan maxed the Artisan Skill (+1). Dagan maxed the Guitar Skill (+1). Yolanda maxed the Sculpting Skill (+1). Yolanda maxed the Fishing Skill (+1). Yolanda maxed the Gardening Skill (+1). Yolanda maxed the Political Career (+1). Yolanda completed her Lifetime Wish (+1). Yolanda left a large tombstone (+2). Dagan left a large tombstone (+2). Of their children before the heir came of age: Arietty maxed the Guitar Skill (+1). Arietty maxed the Painting Skill (+1). Arietty completed her Lifetime Wish (+1). Arietty maxed the Logic Skill (+1). Ambriel maxed the Painting Skill (+1). Ambriel maxed the Writing Skill (+1). Ambriel completed her Lifetime Wish (+1). Ambriel maxed the Logic Skill (+1). Ambriel maxed the Photography Skill (+1). Anastasia and Abraham had 2 children (+2). Anastasia maxed the Athletic Skill (+1). Anastasia maxed the Gardening Skill (+1). Anastasia maxed the Guitar Skill (+1). Anastasia maxed the Handiness Skill (+1). Anastasia maxed the Logic Skill (+1). Anastasia maxed the Painting Skill (+1). Anastasia maxed the Photography Skill (+1). Anastasia completed her Lifetime Wish (+1). Abraham maxed the Athletic Skill (+1). Abraham maxed the Logic Skill (+1). Abraham maxed the Painting Skill (+1). Abraham maxed the Photography Skill (+1). Anastasia got her portrait done (+1). Anastasia maxed the Cooking Skill (+1). Anastasia maxed the Fishing Skill (+1). Anastasia supermaxed the Painting Skill (+1). Anastasia maxed the Writing Skill (+1). Anastasia maxed the Nectar-Making Skill (+1). Abraham maxed the Charisma Skill (+1). Abraham maxed the Cooking Skill (+1). Abraham maxed the Fishing Skill (+1). Abraham maxed the Gardening Skill (+1). Abraham maxed the Handiness Skill (+1). Abraham maxed the Writing Skill (+1). Abraham maxed the Police Career (+1). Abraham completed his Lifetime Wish (+1). Of their children before the heir came of age: Demetri maxed the Logic Skill (+1). Demetri maxed the Photography Skill (+1). Last edited by Livvielove on October 8th, 2017, 4:50 pm, edited 1 time in total. And WE'RE FINISHED getting 'em all transferred over! Progress being made for this generation! Woohooo! Chapter 87: Random Pops is now up! Chapter 88: The Chapter Where Many Things Happen! This one was a doozy! Oh my gosh! What a surprise! It's quite a beast, I know. This challenge took me a bit of time to get, but it's essentially making the most out of the shortest lifespan! I'm super glad you're enjoying it! I love Aiden too, he was such a handsome boy! Thanks so much for taking some time to read my silly challenge! Hehe I hope it continues to amuse you as much as it has me for as long as I've played it! Chapter 90: The Puppeteer, I Mean, Manipulator is now out! One more update coming at you! Chapter 91: Double Engagements and Shoes. I LOVE THIS STORY!!! And now I'm sad that I've read all there is. OMG, I think Nessa is just about the most adorable sim woman I've ever SEEN! And Zach! Oh, they're so perfect! I hope Quinn is happy, and doesn't spend his life in confusion, never knowing what he really wants. At least he always goes back to Meira. Patient woman. Now, correct me if I'm wrong, but he's off the main line enough that his son (Nathanial of the lips) could conceivably marry Nessa's daughter? Frankly, I don't think you need to worry about second cousins. People might find it a bit icky, but you know what? It's legal practically everywhere, and geneticists say that it's totally NOT a problem. Now, first cousins can be a problem if all the first cousins keep marrying each other, and the tree goes practically straight up with all the branches curling right back to the trunk. However, the occasional first cousin (legal in many places) is actually not a genetic problem. I read it somewhere, years ago, and can't remember where, so it must be true. I have a vague recollection of it being connected to a college course, though, so it probably was, if it was part of the material, right? Anyway, it's legal in the game for a *reason* and that is that despite some cultural taboos, it's not actually problematic, genetically speaking. Not cheating, and with that town, finding a non-relative is practically impossible. Although, if you're determined to find a non-relative, and you have University (which I see you do), try cranking up the Social Networking skill. 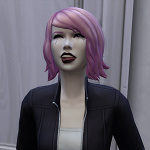 At level 10, you can "seek out" a sim with your choice of traits! The game will then actually CREATE the sim you want. Well, trait-wise. I can't guarantee skin tone. But, hey, you don't have to marry him if you don't want to. Just try, try, again. Livvielove, I love your drama, but I also love your comedy, and this is comedy gold! Hahaha, thank you so much! I'm so sorry for taking so long. Here's two updates for you! I'm starting this now (because who wants to work at 4am when you can read). It might take me awhile, so I'm posting so I don't lose this thread. I'll be back to reply in a few years...j/k! I'm really glad this story is back! I would argue it isn't a short challenge in the sense of collecting pictures and jazz. XD I tend to take more/the same amount of pictures in a number of less days for each generation versus a normal lifespan challenge. THE HEIR TO THE LIP THRONE! Agh I know what you mean. My second and third generation heiresses were both green and I got super worried there. Fingers crossed for your save file! Just got caught up on this. Livvie, you have not lost your touch, even if you haven't touched it in a while. New update for the new year!